Please accept my humble obeisance at your feet. 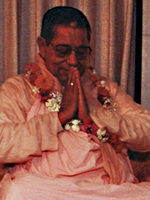 On behalf of Srila Bhakti Pavan Janardan Maharaj, we wish to extend an invitation to join our Sri Chaitanya Saraswat Seva Ashram in the devotional program in honor of the disappearance of our most worshippable and beloved Gurudev, Om Vishnupad Srila Bhakti Sundar Govinda Dev-Goswami Maharaj which manifests on Tuesday, April 16th this year. Today is the grand 90th appearance day celebration of Sri Chaitanya Saraswat Math’s Sevaite-President-Acharya, Om Vishnupad Paramahamsa Parivrajakacharya Sri Srimad Bhakti Sundar Govinda Dev-Goswami Maharaj.. Please take this chance to meditate on any of the following resources in glorification of our most affectionate spiritual guardian and well-wisher. Dear Friend of the Ashram, Please join us for the grand celebration of the divine appearance of Srila Bhakti Sundar Govinda Dev-Goswami Maharaj on December 24th at 11 am in Santa Cruz or 6 pm in San Jose. Please join us for a work party to beautify the puspa samadhi mandir of our His Divine Grace Srila Bhakti Sundar Govinda Dev-Goswami Maharaj on Saturday and Sunday, March 24-25 in anticipation of His Divine Disappearance Festival on Wednesday, March 28th. The Miracle of the Dead Phone Speaking! Four Miracles of Saint Govinda!